Size of this preview: 800 × 404 pixels. Other resolutions: 320 × 162 pixels | 640 × 323 pixels | 1,024 × 518 pixels | 1,280 × 647 pixels | 2,600 × 1,314 pixels. 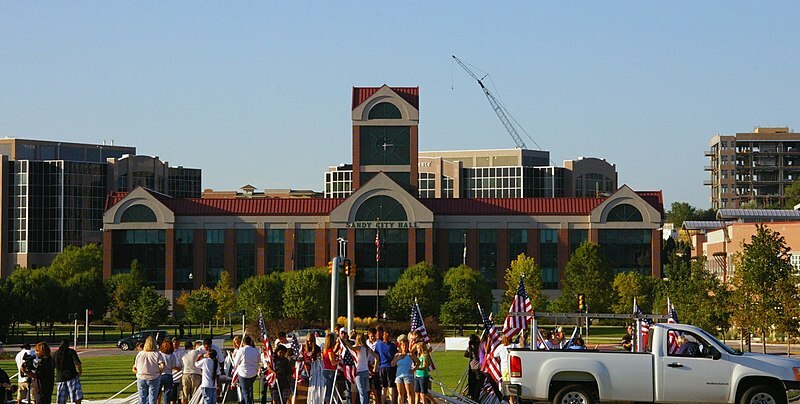 Volunteers set up the Healing Field in front of the city hall in Sandy, Utah on Sept. 10, 2009. This image, originally posted to Flickr, was reviewed on February 4, 2010 by the administrator or reviewer File Upload Bot (Magnus Manske), who confirmed that it was available on Flickr under the stated license on that date.